Although E J Berwind's Newport mansion is grand, it is also supremely harmonious, having been modeled on a chateau in France. E J Berwind, son of a Philadelphia tradesman, got an appointment to the US Naval Academy, and served in the Navy until mustered out with high rank because of an injury. He joined his brother's coal company, built it into a huge business with its own mining companies, ships and railroads, and ultimately secured the contract to supply all US Navy ships with coal. 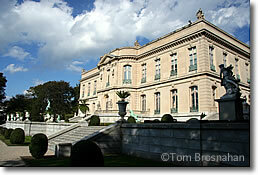 With the millions in profits he built The Elms, perhaps the most gracious and pleasant of the Newport mansions. The Elms is a work of Philadelphia Gilded Age architect Horace Trumbauer (1868-1938), who designed many other immense private homes, as well as Harvard University's Widener Library and many of the buildings at Duke University. Trumbauer's inspiration for The Elms was the 18th-century Chateau d'Asnières on the norther outskirts of Paris. The sumptuous salons and chambers you can visit today were served by a staff of about 40, whose work and living quarters were hidden in the basement and top floors of the house. Mr & Mrs Berwind occupied the house for only six to eight weeks each summer, from mid-July through August. The sunken formal garden beyond the little belvederes at the far end of the spacious lawn is not visible from the house. Designed by a French landscape architect, it comes as a pleasant surprise when you leave the house to explore the grounds. The Elms was threatened with destruction in the 1960s when a land development firm bought it and planned to build a shopping center on the site. All of its precious furnishings were auctioned off, but a late intervention by the Preservation Society saved the house, and over the years many of the original furnishings have been reclaimed through purchase, donation or loan. The Elms, perhaps the most beautiful and harmonious of Newport's palatial mansions.